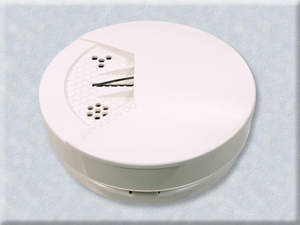 The FS360 is one of the most reliable optical smoke and Heat detectors on the market. It provides extremely accurate detection in its’ monitoring area. The wireless design ensures an easy installation and low battery indication ensures constant vigilance. The detector has ID code register to alarm console that can report sensor number and alarm event. Photoelectric chamber and heat sensor do dual sensor working. Alarm display by LED and 85dB buzzer. LED indicates the transmitting and battery low condition. Low standby current on sleep mode to save power. The detector can addressable report the fire alarm event and sensor number to the alarm console. The detector also can be combined with Fronti alarm console or GSM auto dialer to report SMS or voice message. Low battery and tamper switch detector function can report to alarm console. It has auto report to confirm on normal working.